We’d love your help. Let us know what’s wrong with this preview of Moribund by T.S. Petersen. Ending up in front of me is no one's idea of a good day - besides mine. I'm Evanee Shepard, Acrasin General Hospital's Forensic Pathologist and suspected psychic. My life was finally heading in the right direction until the night I went to my co-worker's house party, and met him again. Erick Tenebris, local mystery man who left Murder Point Bay 12 years ago, only to return Ending up in front of me is no one's idea of a good day - besides mine. I'm Evanee Shepard, Acrasin General Hospital's Forensic Pathologist and suspected psychic. My life was finally heading in the right direction until the night I went to my co-worker's house party, and met him again. Erick Tenebris, local mystery man who left Murder Point Bay 12 years ago, only to return at my weakest hour. Now my life is in disarray, and my feelings for him aren't far behind that. Finding out I'm part of a supernatural community is not what I wanted for my life; neither is autopsying the three victims whose souls are fractured and partially drained by something I've never encountered before. To ask other readers questions about Moribund, please sign up. 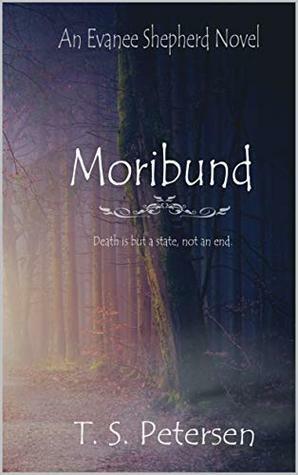 It's no secret that I'm a fan of paranormal stories and this one, Moribund by T.S.Petersen is a treat and a fascinating read. I loved the quirky and feisty character Evanee, who is a Forensic Pathologist and suspected psychic. And Erick, her mysterious love interest isn't bad either. I enjoyed the visual world building and plot. As this is book one in a series, I look forward to reading how these characters develop and will be diving into future books when they are available.